There are a lot of bloggers advocating credit card debt settlement and sometimes they try too hard to get that commission. As you know I settled my debts and am better off for it. That being said before you decide to settle anything you should know all the details first. In this article we will go over all the myths out there about credit card debt settlement. Some debtors will try to arrange a settlement where the collection agency will agree to take the debt off their credit report in exchange for a payment. Don’t fall for that! Pay for delete is a scam! Most collection agencies have contracts with the credit bureaus which specifically prohibit ‘pay for delete’ type settlements! The credit bureaus require this to do business with them in order to protect the integrity of their credit reports. If they allowed collection agencies to ‘delete for pay’ that would be the number 1 tool they would use to coerce debtors into paying up. What collection agencies will do, however, is word their offers very carefully. When I was in debt the collections agent would tell me things like “If you pay I think [emphasis mine] I can take it off your credit”. They’re allowed to mislead you into thinking they can take it off but they can’t say it directly. When a debt settlement, formally known as an “offer in compromise,” is agreed upon by a creditor and paid by a debtor the remaining balance on the account is forgiven. The exception is if a consumer unwittingly agrees to be liable for the remaining balance. This one of many reasons why I don’t recommend trying to settle substantial debt by yourself. Reality — Settling a debt does nothing to improve your credit score. Let’s step back and take a look at what a credit report is. The purpose of a credit report is to indicate to lenders how likely it is a consumer will pay back his/her obligations so a lender can decide how much interest to charge or whether to lend at all to a potential customer. A debt settlement by definition is not paying the amount previously agreed to for whatever reason. How on Earth would that improve a credit score? There is an exception the newest versions of the credit scoring by VantageScore and FICO have said that they will ignore all collection accounts with a zero balance whether its paid or settled. Therefore there are some scenarios in which settling can actually improve a credit score. So long as your debt is still within the statute of limitations then its advisable to settle it rather than ignore it. Because you can still be sued and once that happens and the creditor gets a judgment against you they have a lot more latitude to collect the debt than before. Including garnishing your wages. Trust me you don’t want that. A debt settlement is a good way to just shake hands with your creditor(s) and part ways. It’s a lot less stressful than dealing with those annoying harassing phone calls and a lot cheaper than having to deal with a lawsuit and the subsequent judgement. If you get a reputable debt settlement company often you can make your debts go away for half or less than what was originally owed. 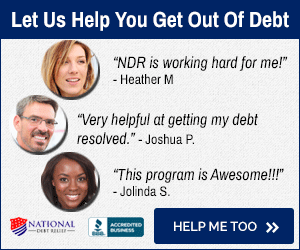 I settled my debts with National Debt Relief and they did an excellent job. Read my review. However that doesn’t mean debt settlement is right for everyone. Hopefully this article will give the tools needed to make a more informed decision. For tax debt Curadebt is a better choice!